Huntington Ingalls Industries’ (HII) Newport News Shipbuilding division on June 25, 2018 delivered the newest nuclear-powered fast attack submarine to the U.S. Navy. The future USS Indiana (SSN-789) is the 16th Virginia-class submarine built as part of the teaming agreement with General Dynamics Electric Boat and the eighth delivered by Newport News. «We are proud to deliver Indiana to the Navy», said Dave Bolcar, Newport News’ vice president of submarine construction. «For the nearly 4,000 shipbuilders who participated in construction of the boat, there is nothing more important than knowing that this vessel will support the Navy’s missions». Virginia-class submarines are built for a broad spectrum of open-ocean and littoral missions to replace the Navy’s Los Angeles-class submarines as they are retired. 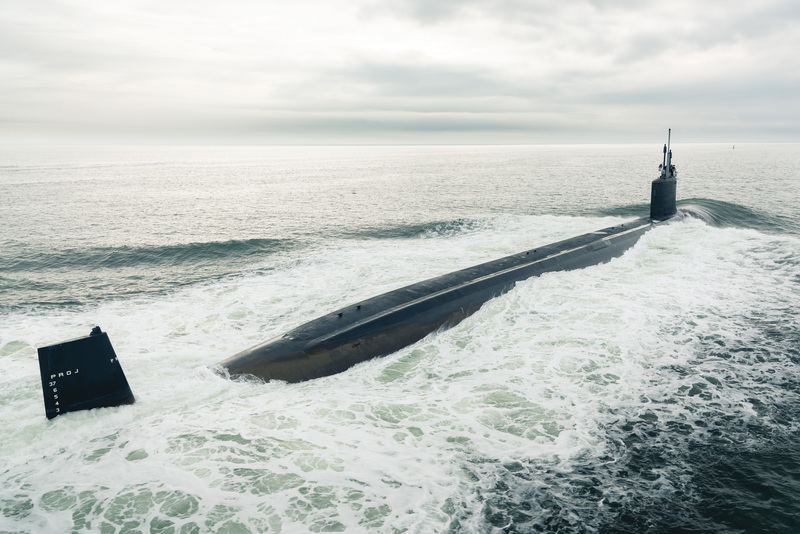 Virginia-class submarines incorporate dozens of new technologies and innovations that increase firepower, maneuverability and stealth and significantly enhance their warfighting capabilities. These submarines are capable of supporting multiple mission areas and can operate at submerged speeds of more than 25 knots/28 mph/46.3 km/h for months at a time. Huntington Ingalls Industries is America’s largest military shipbuilding company and a provider of professional services to partners in government and industry. For more than a century, HII’s Newport News and Ingalls shipbuilding divisions in Virginia and Mississippi have built more ships in more ship classes than any other U.S. naval shipbuilder. HII’s Technical Solutions division provides a wide range of professional services through its Fleet Support, Integrated Missions Solutions, Nuclear & Environmental, and Oil & Gas groups. Headquartered in Newport News, Virginia, HII employs nearly 39,000 people operating both domestically and internationally.